Wake Forest Baptist Medical Center, a nationally recognized fully integrated academic medical center and health system, is dedicated to improving patient care and advancing medical research. However, its aging legacy IT infrastructure had to be modernized in order to meet the requirements of the business. Wake Forest Health turned to market-leading EMC Converged Infrastructure from VCE to simplify IT operations and drive business efficiency. In addition to multiple VCE Vblock® systems, the Vblock 540 with EMC XtremIO all-flash storage enabled significant improvements in application infrastructure performance and agility. After deploying the Vblock 540, Wake Forest experienced an overall 30 percent performance improvement to end users and decreased the time needed for storage provisioning from 24 hours to less than an hour. 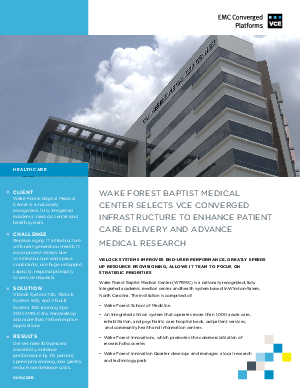 Read this white paper to find out more about how EMC Converged Infrastructure from VCE helped Wake Forest Baptist Medical Center modernize its business.